ENL Group has strengthened its presence in the Auckland region by opening a new Furuno focused showroom in Westhaven. Situated in the heart of Westhaven Marina, the new purpose built 120sqm showroom will be co-located with R Marine Flagship at 23 Westhaven Drive, and will be open from Monday-Friday 8.30am-5.00pm. Targeting the superyacht and launch market the showroom will have the largest display of marine electronics in Australasia. It will be supported by the largest pool of specialized marine electronic engineers and the customer care team via the Furuno New Zealand (ENL) head office in Glenfield. ENL Group Managing Director Gareth Hodson says the new showroom will offer customers easier access to the brand, allow them to purchase product and get technical support more readily. “Westhaven has always been the traditional home of the Auckland marine industry, so it makes sense for Furuno to have a strong presence here in the supply of marine electronics,” says Hodson. 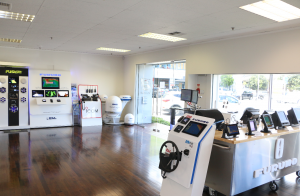 “Our showroom is able to cater to the whole Auckland marine community, from fish finders to the most sophisticated electronic systems for super yachts – we have the whole range. The centralised showroom will also be supporting our Auckland dealers, brokers and customer base ensuring they get the best product support. The Westhaven showroom will also feature everything in ENL’s broad portfolio including Furuno’s extensive line of Radar, Sounders, MFD’s and Sonars, KVH Satellite TV and Satellite communications, Airmar Transducers, Fusion Entertainment, Icom and Uniden communications, Cristec battery Chargers, Lumishore underwater lighting, ENL’s world leading WASSP multibeam sonar and much more. The new Westhaven showroom adds to Furuno New Zealand’s head office in Glenfield and its branch in Nelson. ENL Group, the distributor for Furuno is now a subsidiary of Furuno Japan.